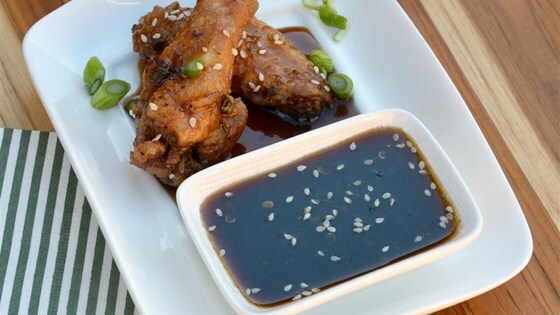 "My boyfriend and I fried some wings for the football game on Sunday, and he decided he wanted a Asian-type sauce. Myself being experimental type, decided to concoct something up and it turned out to be a touchdown recipe!" 1Heat olive oil and sesame seeds in a small saucepan over low heat; cook and stir until seeds are slightly toasted, 3 to 5 minutes. Add soy sauce, brown sugar, honey, and vinegar; whisk until brown sugar is dissolved, 1 to 2 minutes. 2Mix ginger paste, ground mustard, and red pepper flakes into soy sauce mixture; whisk until sauce is smooth, 2 to 3 minutes. Bring sauce to a boil; reduce heat and simmer until thickened, about 5 minutes more. For more spice add more red pepper flakes or a dash of cayenne pepper!